The crew of Liverpool & Manchester Railway 0-4-2 No 57 'Lion' pose for the camera near Dunchurch station in October 1961. The locomotive was an early 0-4-2 design built by Todd, Kitson & Laird (later Kitsons) of Leeds in 1838 and was one of a pair designed for hauling freight (the other, No 58 was called Tiger). In 1859 Lion was sold to the Mersey Docks and Harbour Board and installed as a stationary pumping engine at Princes Dock. She was rescued by members of the Liverpool Engineering Society, to which body she was presented by the Dock Board in 1928. After restoration at the Crewe railway works she took part in the centenary celebrations of the Liverpool and Manchester Railway in 1930, pulling a replica train. During the period prior to the Second World War Lion stood on a plinth at Lime Street Station but was removed in 1941 and not replaced. Tony Newman writes, 'the locomotive was being tested prior to taking part in the filming of a short general interest newsclip by 'Movietone'. 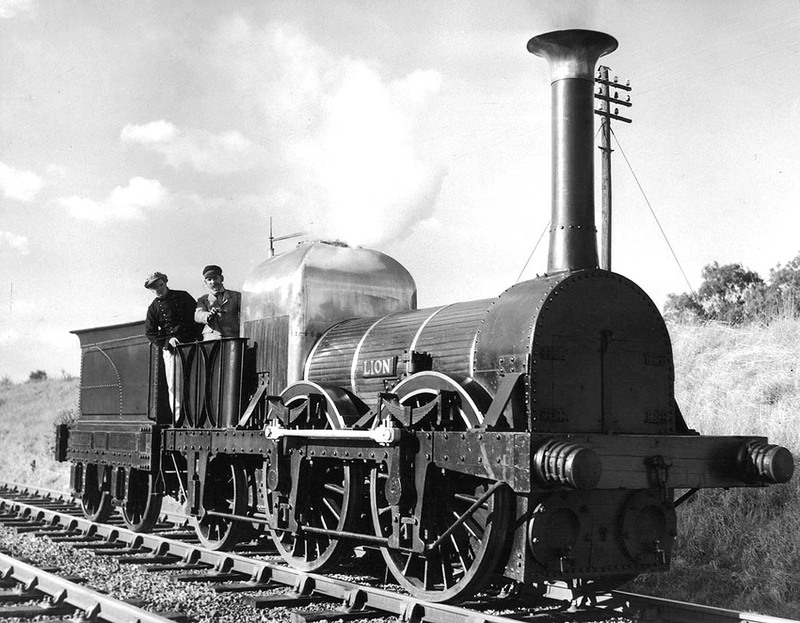 On the occasion of the locomotive's visit to Dunchurch, and its brief run on the Rugby-Dunchurch length of the Leamington line in 1961, the footplate crew wearing appropriate period costume, I myself saw the engine parked in Rugby Midland shed'.